As a New Yorker and working woman, my bag must always be equipped with certain essentials. I've trained myself to leave my house everyday with the things I will need to make it through, all the way to the evening. Now, for some people this might only mean their cellphone, keys and credit cards, but my list just happens to be a tad bit longer than that. 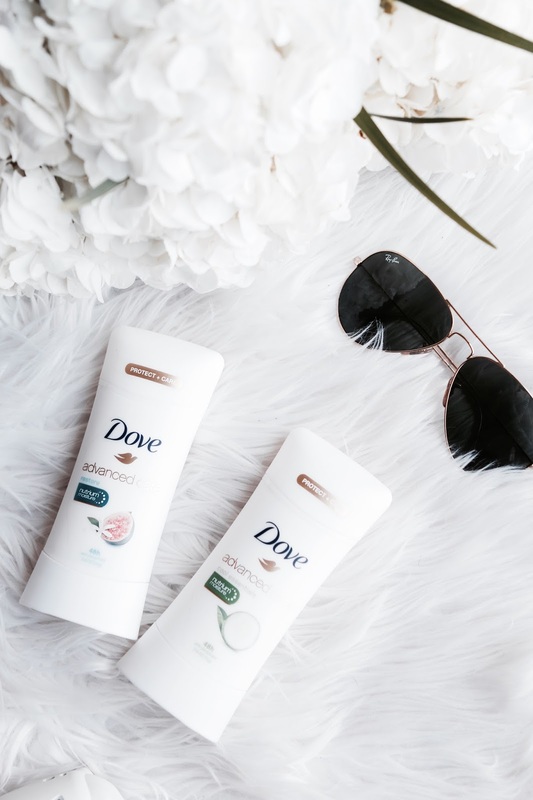 Today, in partnership with Dove, I'm sharing with you guys my everyday essentials a.k.a the tidbits I need to make it through my long and hectic New York City day. Because you just never know where the day will take you, I always pack a pair of sunnies that will complete any look! My usual suspects are these Ray-Ban aviators, if it isn't obvious by my Insta! Not only because I'm a blogger but because I genuinely love photography, I always have some sort of camera device with me! Whether it's my Fujifilm polaroid or my handy iPhone, I'm always ready to capture beautiful moments + spaces! Lip balm, lipstick and concealer is the trio that can always be found in my purse. 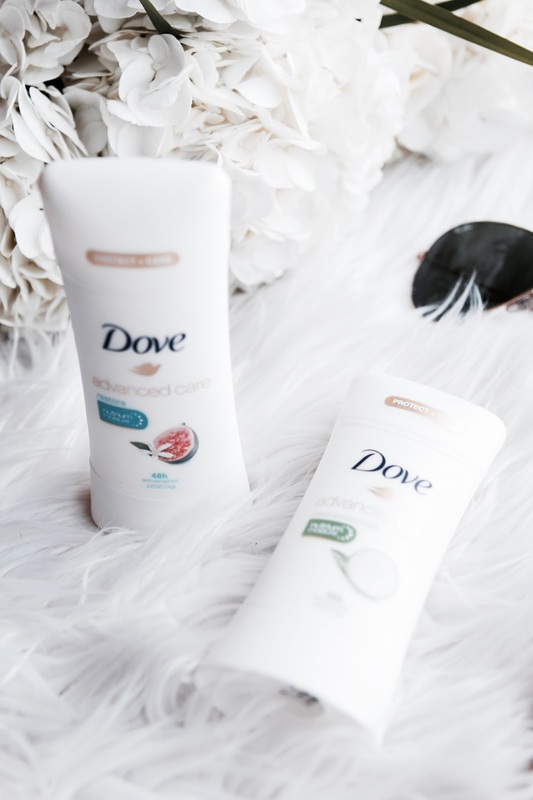 An essential that isn't quite "on the nose": Dove's Advanced Care Antiperspirant! 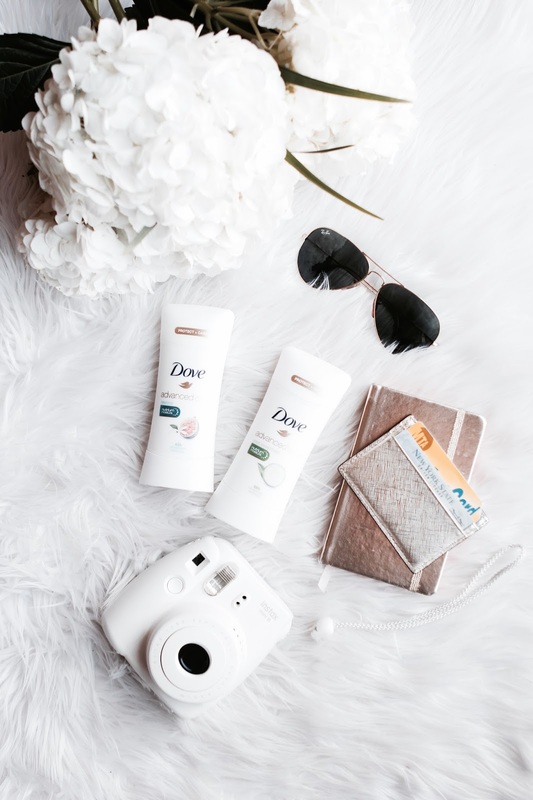 Dove products have been part of my personal care must-haves for quite some time now and in my experience, their antiperspirants always keep me fresh and confident all day long no matter where I'm heading. With 48-hour odor and wetness protection, their NutriumMoisture formula keeps your underarms feeling smooth and soft. Not to mention, it doesn't contain any harsh alcohol, which has been attributed to darkening of the skin under your arms! I've been loving cardholders lately as they fit seamlessly into just about any bag! This one by Kate Spade holds my cards, ID, metro card and cash just perfectly. As a blogger you never know where or when inspiration may hit you. And since I'm more of a old-school, write-things-down kind of gal I always keep a small notepad with me everywhere I go. I've kept this kate spade one on heavy rotation lately. So there you have it folks, the items that keep my head above water on a daily basis! But tell me in the comments, what is the one thing you guys can't leave the house without? Thank you Nicole! Same here for the sunnies. Love these photos! Great post- inspired to do something similar in terms of "What's in my bag"
You should! I'm always curious as to what people carry on an everyday basis! Love Dove, I wear it every day, so gentle and lasts all day. Tell me about it! Their products are amazing! Thank you Claire- such an essential! I have the same deodorant! It smells so good and I do feel like it's more moisturizing than other anti-perspirants. I never carry it in my bag though so it's a disaster if I leave the house without remembering to apply it!